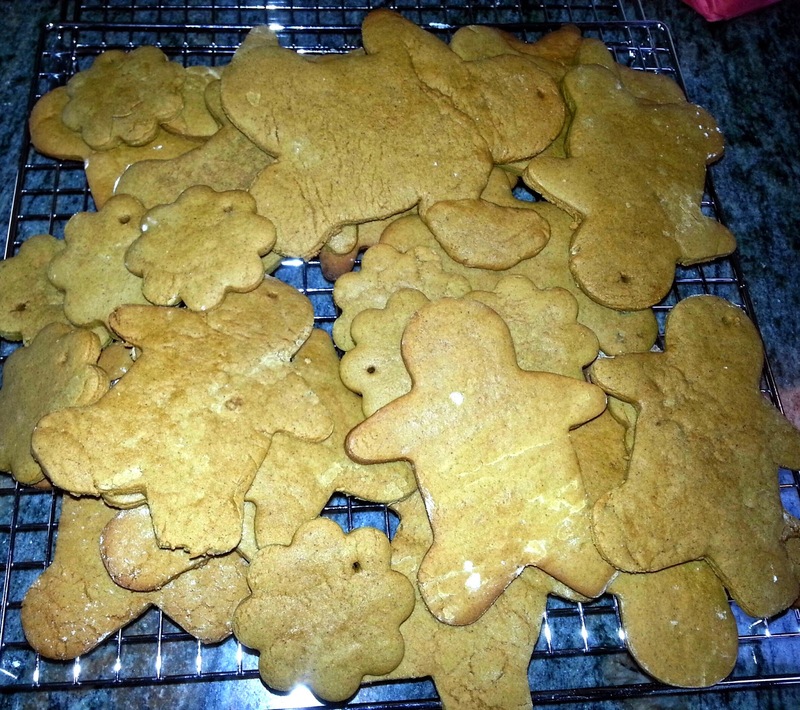 COOKIES: SUGAR, GINGERPEOPLE, SHORTBREAD AND MORE! Merry Christmas to you all! 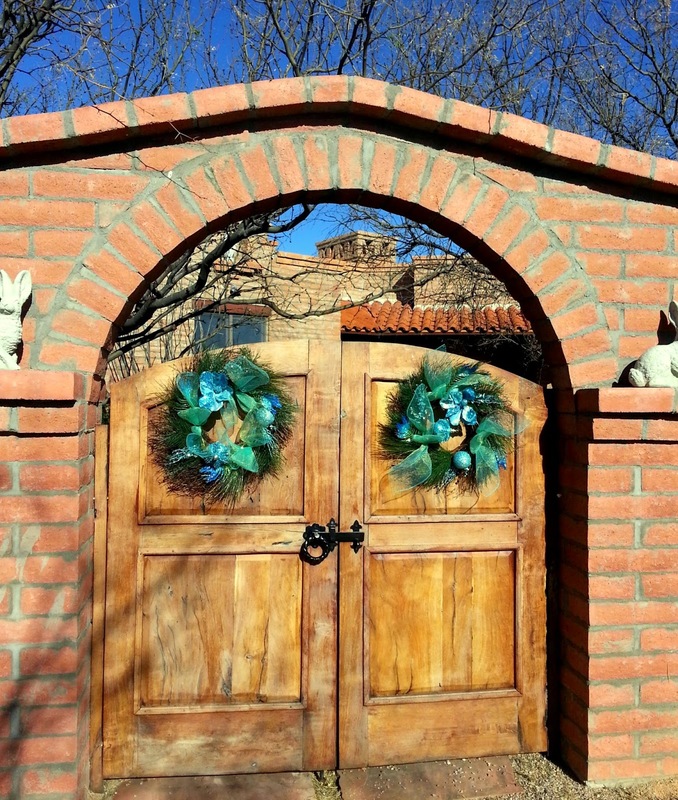 I have never blogged on Christmas Day, but it seemed like the right thing to do this afternoon. None of these cookie recipes are exclusively for Christmas, although they are traditional. If you are cutting the sugar cookies into shapes, you could fashion for any occasion. This recipe came from Betty Crocker. They are easy to put together and roll out and looked great on our tree! It was also fun eating them off the tree if you get a sugar craving during the festive holiday season! I sometimes struggle with rolled cookies, but these have so much butter in them they rolled very easily. Plus another hint is to make the dough the day before and keep chilled in fridge overnight until ready to roll. Just let them sit out a bit before rolling next day. In large bowl, mix 1 1/2 cups powdered sugar, the butter, 1 tsp. vanilla, almond extract and egg until well blended. Stir in flour, baking soda and cream of tartar. Cover and refrigerate at least 3 hours or overnight. Heat oven to 375. Divide dough in half. On lightly floured surface, roll each half of dough to 1/4 inch thickness. Cut into assorted shapes with cookie cutters; free-form; or use patterns from children's books or Christmas motifs. If cookies are to be hung as decorations, make a hole in each 1/4 inch from top. I used a skewer and then when they came out of the oven reinforced the opening of each hole. Place on ungreased cookie sheet. Bake 7-10 minutes or until light brown. They get browner as they cool. Remove from cookie sheet to rack. Cool completely--about 30 minutes and then decorate either with frosting or colored sugar or let your imagination run wild. My decorations were not very sophisticated or fancy, but the cookies tasted great. One year I made anatomically correct Ginger People. 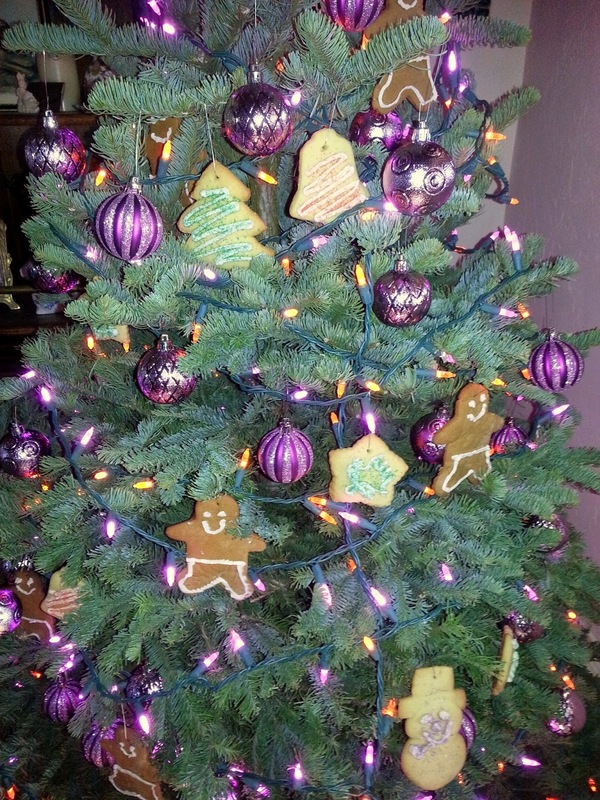 I decorated my tree that year with the cookies and it was so fun watching people's reactions as they viewed the tree and realized these Ginger People were without clothes! This year I made only Men and put little pants on them. I also made some Ginger Flowers. Divide dough in half and wrap each half in plastic and let stand at room temperature for at least 2 hours. I refrigerated overnight and then let stand at room temp for about 1/2 hour before proceeding. Preheat oven to 375. Prepare baking sheets by lining with parchment. I skipped that step and just put the rolled and cut Ginger People onto the baking sheet. Place 1 portion of the dough on a lightly floured surface. I rolled each of these recipes right on my counter. Sprinkle flour over dough and rolling pin. Roll dough to a scant 1/4 inch. This dough was not as forgiving as the Sugar Cookies, but look at the butter ratio! Use additional flour to avoid sticking. 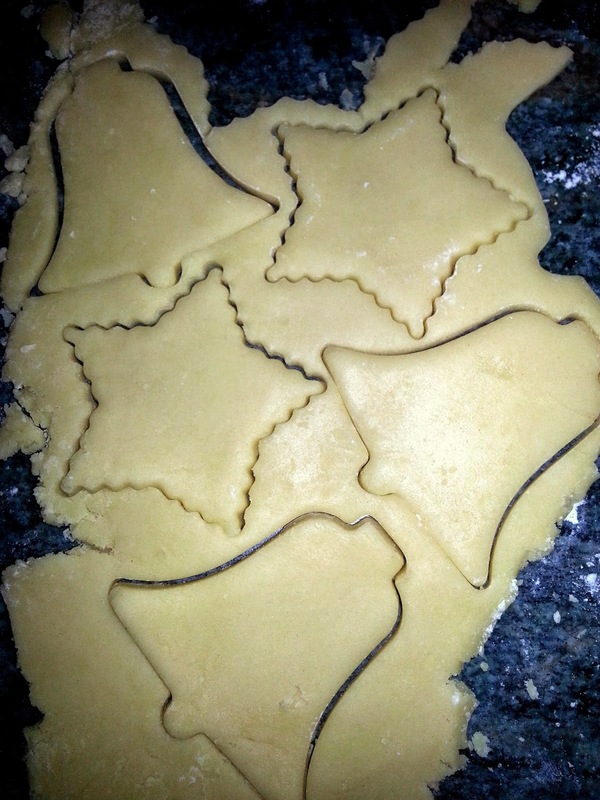 Cut out cookies with desired cutter-Gingerbread, of course, being the most traditional. Space cookies 1 1/2 inch part. Bake 1 sheet at a time for 7-10 minutes. Lower cooking time means softer cookies so depends if you like them crispy or soft. I like them crispy. After cookies are cooled decorate as you like. I thought these 2 batches would do it, but my husband asked if I would make MORE...so I made a shortbread cookie and melted 2 different types of chocolate on top. Add flour, salt and powdered sugar to food processor and pulse to combine. This is a case where you really do need to use your food processor. Add vanilla, butter and 1 tsp. water. Pulse together just until dough is formed. Put the dough on a sheet of plastic and roll into a log about 2 1/2 inches in diameter (I wish I had taken a picture of this because it looks awesome all rolled up in plastic!). Tightly twist each end of the wrap in opposite directions. Chill dough in fridge at least 30 minutes. I chilled for about 5 hours. Slice the log into 1/3 inch thick discs. Arrange on nonstick cookies sheets about 2 inches apart. Bake until the edges are just light brown--about 7-10 minutes; rotating the pans half way through the baking process. Remove from the oven and if topping with chocolate add 1 square per cookie and pop back in the oven for a few seconds. Remove and swirl chocolate. 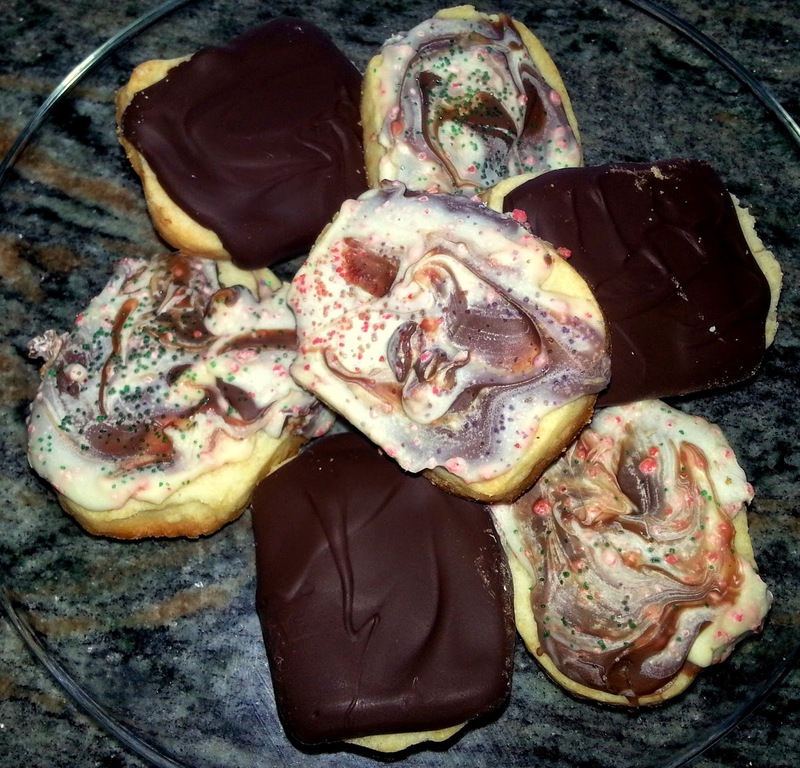 I used Ghiradelli semi-sweet and Ghiradelli white chocolate with peppermint bark. Let cool completely on racks and then start eating! Next time I am going to add toasted pecans to the dough before forming. Closing today with the dessert we are having with our own Christmas dinner. My husband loved his Boston Cream Pie birthday cake so much he asked if I would make another for Christmas. 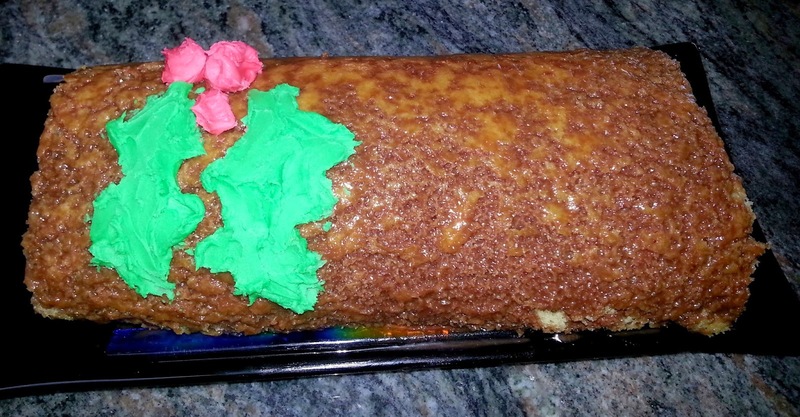 I decided to make a Boston Cream Yule log using the Pastry Cream (see previous blog recipe, but note I forgot to say how much sugar to use in the Pastry Cream. Use 1/2 cup.). I made a Jelly Roll for the cake base, rolled it with the Pastry Cream and frosted with Karen's fabulous Chocolate Ganache. I should've used the traditional Mocha butter cream my Mom used to make with her Yule log. 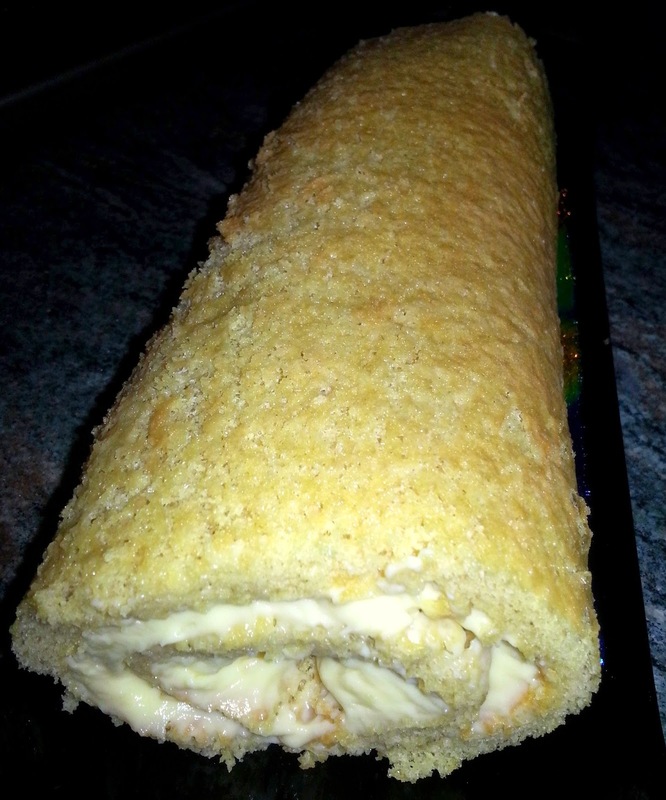 Because a Jelly Roll is basically sponge cake, it totally absorbed the sauce. It doesn't look that pretty, but I assure you it is insanely delicious! Here's the Jelly Roll right out of the oven. And here's me spreading the Pastry Cream into the Jelly Roll sponge cake. Preheat oven to 375. Spray a cookie sheet (11 x 15) with Pam. Fit with waxed paper (it's good to have a little overhang on short sides) and spray again with Pam or any cooking spray. Whisk eggs, sugar, vanilla and water until light. Mix in dry ingredients. Pour the very thin batter onto the baking/cookie sheet. Bake about 10 minutes until the sponge is golden and springs to the touch. Turn out on a dishtowel wrung out in cold water. Remove the waxed paper immediately. I got a phone call just as I was about to remove. Because the cake keeps cooking even after out of the oven, do not wait to remove the waxed paper. Let cool slightly and then fill with either jelly, jam, or in this case Pastry Cream! The dishtowel will help you begin the process of rolling. 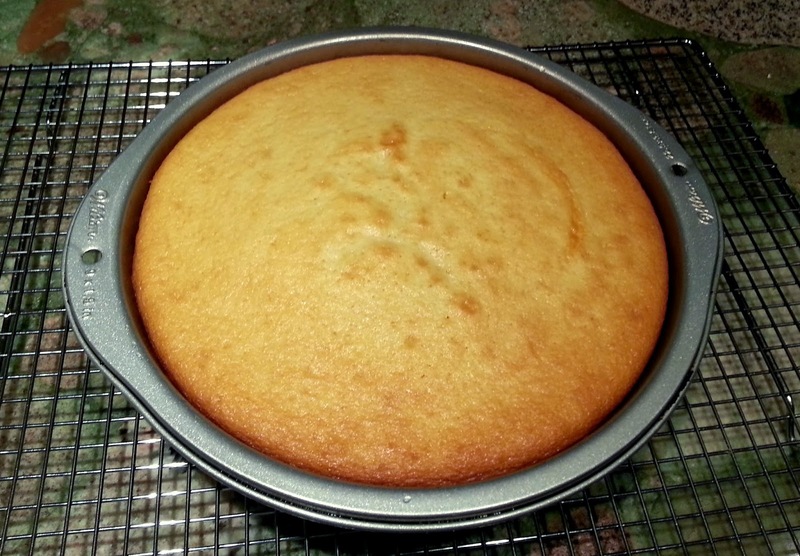 It really is easy as the cake is super-moist and very pliable. I then topped with the Chocolate Ganache (see previous blog recipe) and decorated with a little colored butter cream frosting. A cake decorator I am not!, but I do love playing with food so had a ball putting this Yule log together for our festive Christmas dinner. I hope you have all had a warm and wonderful Christmas filled with love, family, good food and holiday cheer. ALL THE BEST OF THE HOLIDAY SEASON! Thanksgiving has come and gone. I hope you had a beautiful day filled with food and good cheer. I have so much to be grateful for and am blessed with lots of love, good health, a beautiful family and many wonderful friends. Thank you all for helping to make my life tremendous! Last time we talked about Jerry's birthday--the unofficial kick-off of the holiday season. 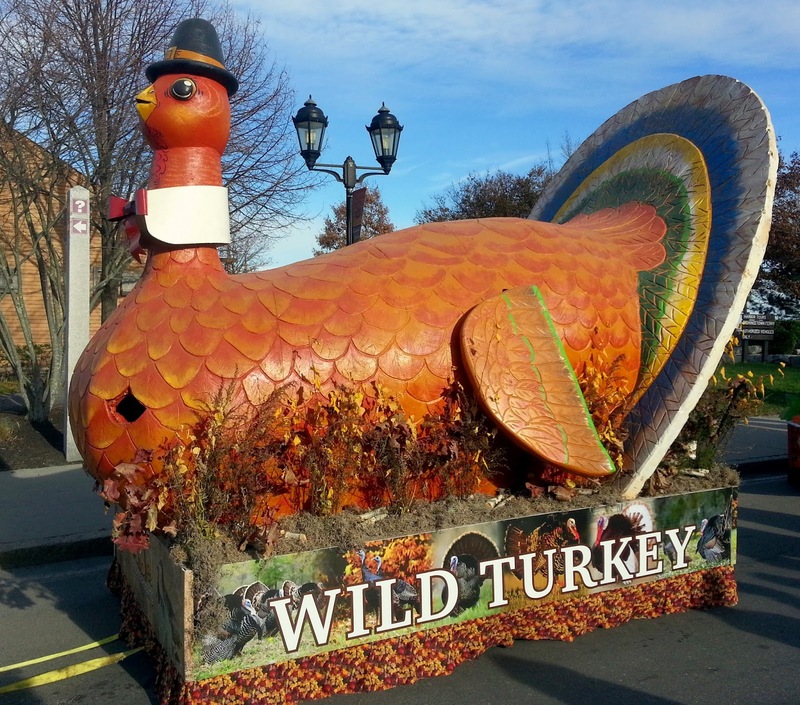 From that event we roll into Thanksgiving and then our wedding anniversary (21 years and counting!) and now we're steaming ahead toward Christmas! I made too much food (again) for our Thanksgiving gathering, which may not surprise you, but it all came out beautifully and was loads of fun. 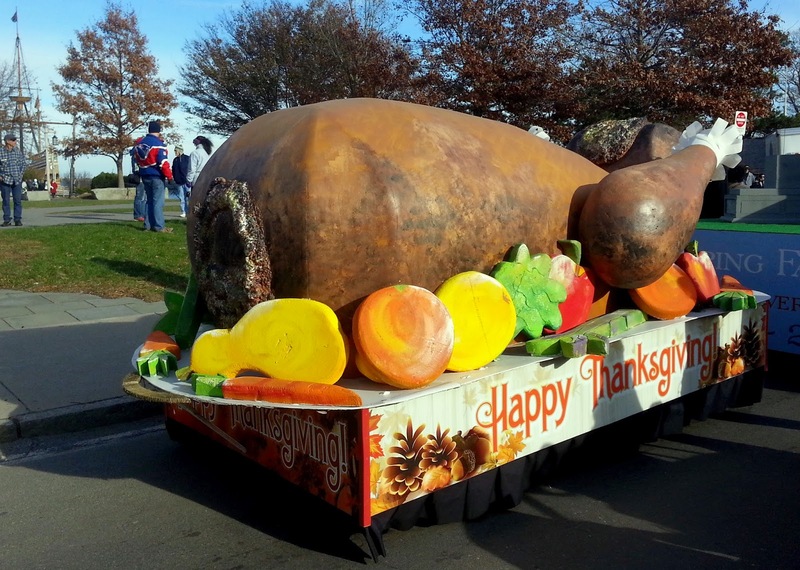 I prepped for about one week prior to the big day so things came together easily on Thanksgiving day. 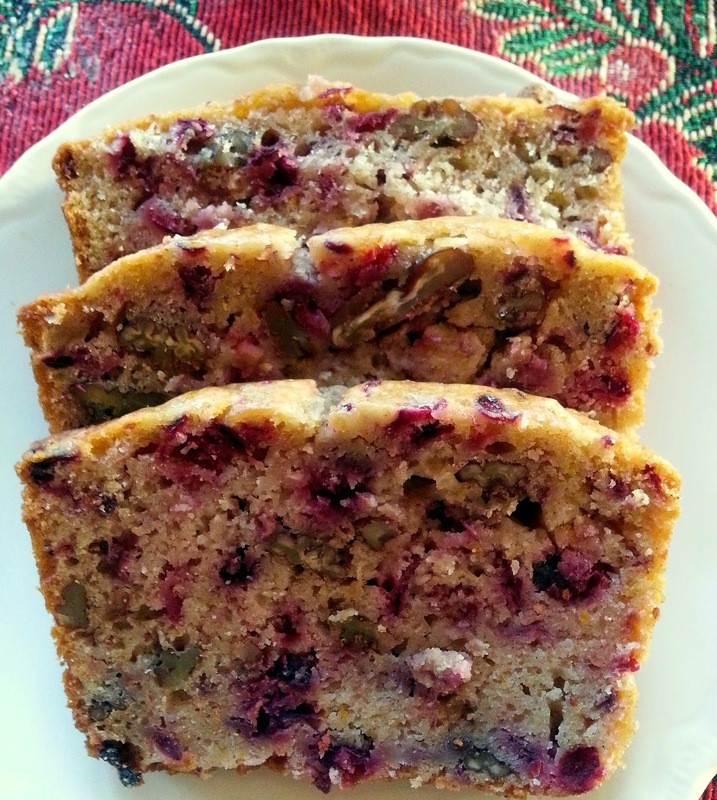 I included 3 new items this year that I want to share with you: Mile-High Apple Pie (a Martha Stewart recipe); the most delicious and moist Cranberry Nut bread, and Cranberry Nut Biscotti's. My brother, Skip and wife Esther also brought a Vanilla Cake with Chocolate Bourbon frosting and a very special Ginger-infused Pumpkin Pie with Toasted Hazelnuts; both very yummy. Let's start with the apple pie. 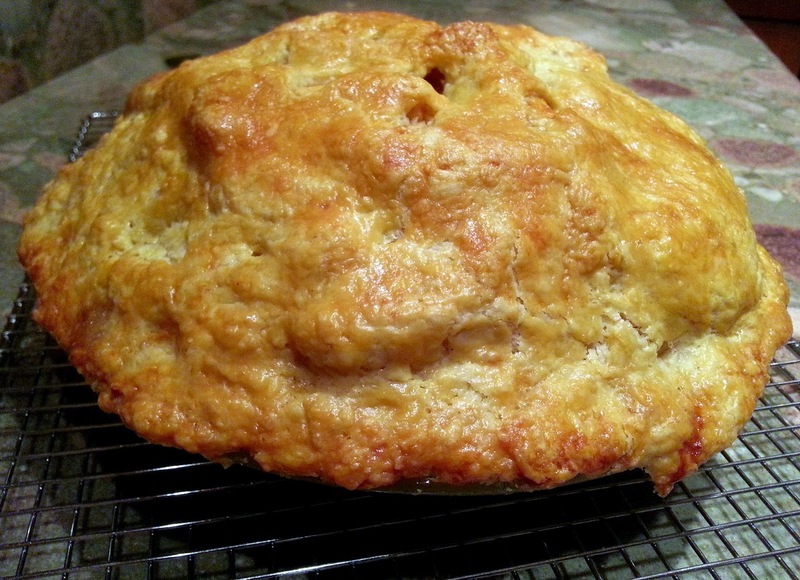 This is one of the best apple pie recipes I have ever used. It calls for 14 apples! The Pate Brisee crust is loaded with 2 sticks of butter! Best of all Martha suggests making it the day before. 5 1/2 lbs. firm tart apples (about 14). I used Granny Smith, Cortland, Gala and a couple Macs. Preheat oven to 450 degrees. On a lightly floured work surface, roll out the smaller piece of Pate Brisee (recipe follows) into a 15 inch round about 1/8 inch thick, dusting surface with flour to prevent sticking, as needed. Brush off excess flour. Line pie plate with dough, pressing it into the corners. Trim the dough to within 1 inch of the pie plate. Cover with plastic wrap; refrigerate. Roll out remaining piece of dough into an 18 inch round. Transfer to a baking sheet; cover with plastic wrap and refrigerate until ready to use. Peel and core apples, and cut into 1/4 inch thick slices. Place slices in a large bowl, sprinkle with lemon juice to prevent discoloration. In a small bowl, combine flour, sugar, and cinnamon. Toss with apple slices. Remove remaining dough from fridge. 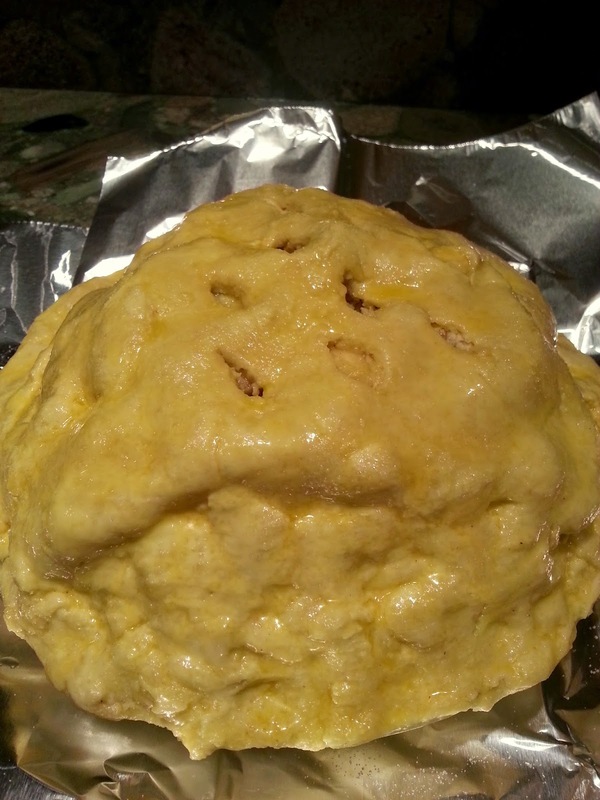 Place apple mixture into prepared pie plate, mounding it in a tall pie. It will be very high! Dot filling with butter. Place the larger piece of dough over the apples. Tuck edge of top dough between edge of bottom dough and rim of pan. Using your fingers, gently press both layers of dough along the edge to seal, and crimp. You can also use a fork to make an interesting pattern on the edge. I just used my fingers. Pie, glazed with egg wash and ready to go into the hot oven. Using a paring knife, cut several vents in top of dough to allow steam to escape. In a small bowl, whisk together egg yolk with 2 Tbsp. water to make a glaze. Brush surface with egg glaze; sprinkle with sugar. Place on a foil lined baking sheet to catch any juices that may overflow during baking. Bake until crust begins to turn golden, about 15 minutes. Reduce oven temp to 350 and continue baking until crust is a rich, golden brown and juices are bubbling; 45-50 minutes. Remove from oven, and let cool completely (or overnight) before serving. I love this rich French pie crust and it is perfect for either sweet or savory pies, such as quiche. By nature this is a crumbly dough, but is quite forgiving because it has so much butter in it. Pulse flour and salt in a food processor to combine. Add butter, pulse until mixture resembles coarse crumbs with some larger pieces remaining. Unfortunately my food processer is in Arizona and I am still in Massachusetts so had to use the old-fashioned method of cutting the butter and flour together using two table knives--much more work and not as even texture, but can be done. Evenly drizzle 1/4 cup ice water over mixture. Pulse until dough is crumbly but holds together when squeezed. If dough is too dry, add up to 1/4 cup more ice water, 1 Tbsp. at a time, and pulse to combine. Turn out dough onto a floured surface and divide dough in two with one piece slightly larger than the other. Wrap each piece in plastic and refrigerate until firm, about 1 hour or up to 1 day. Roll out the smaller piece first to a 15 inch round. Line the pie plate; cover and put back in fridge until ready to use. Roll the second piece out to about an 18 inch (1/8 inch thick) round and do the same. I have to admit making pie crust is not my strong suit, but this time it actually worked pretty well. For this years meal I made my traditional Cranberry-Ginger Sauce, but added more fresh ginger root than usual and a couple Granny Smith apples. I also used Clementines (both juice and zest) instead of orange. 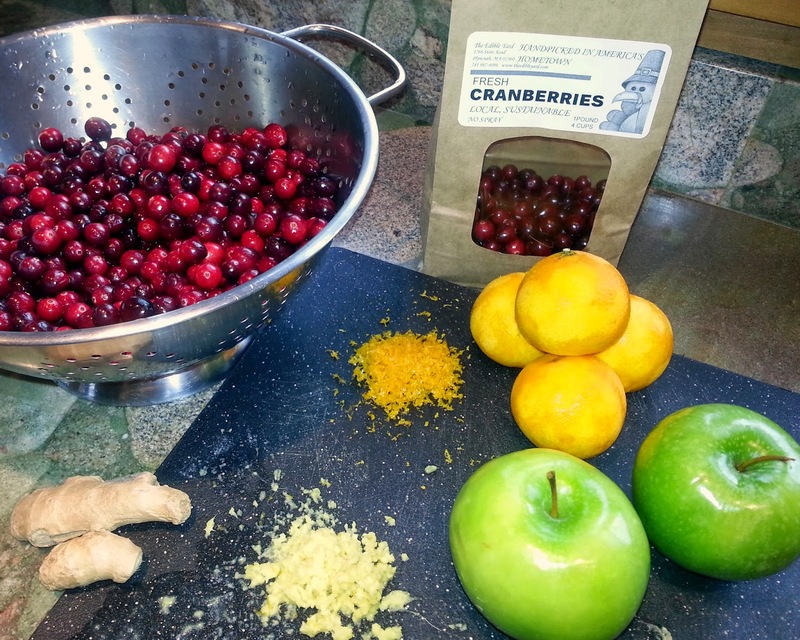 The cranberries came from Teri's Farmstand (https://www.facebook.com/teri.a.snyder?fref=nf). She is selling them for The Edible Yard right here in Plymouth. They were perfectly ripe with no rotten berries among them. 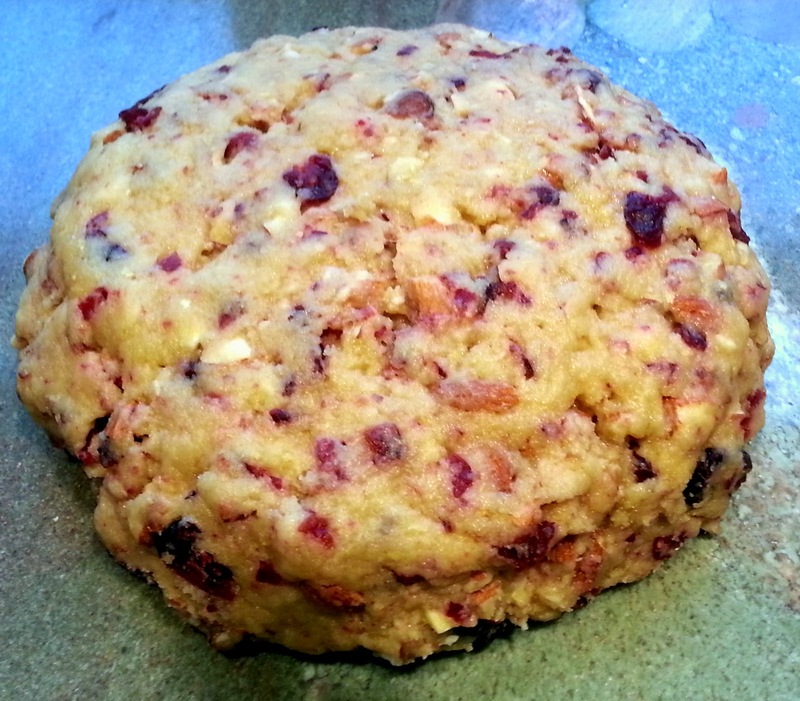 I used these cranberries for the Cranberry Nut Bread as well. This recipe came from a food blogger called Once Upon a Chef. Similar to Jennifer Segal I thought I would use the recipe from Oceanspray, but did a little more digging and hers sounded MUCH better. 2 tsp. granted orange zest from 1 orange or in my case 2 Clementines. Preheat oven to 375. Spray bottom of 9x5 inch loaf pan with non-stick cooking spray. I was out so used a generous amount of butter. In a small bowl, stir together orange juice, orange zest, buttermilk, butter and egg. Set aside. In a large bowl, whisk together flour, sugar, salt, cinnamon, baking powder, and baking soda. Stir liquid ingredients into dry with rubber spatula until just moistened. 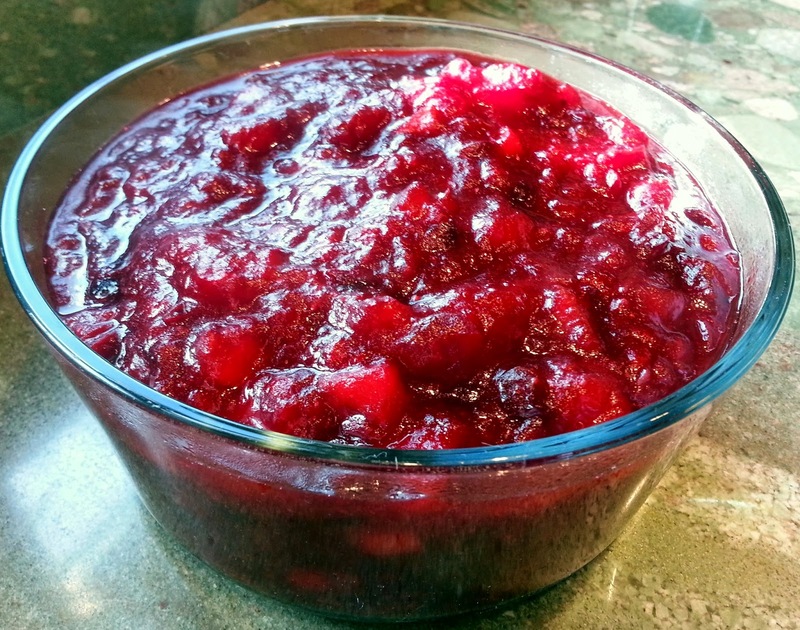 Gently stir in cranberries and nuts. Do not overmix. Scrape batter into prepared loaf pan and spread evenly with a rubber spatula. Bake for 20 minutes, then reduce heat to 350 degrees. Continue to bake until golden brown and toothpick inserted into center of loaf comes out clean; about 45 minutes longer. Cool loaf in pan for about 10 minutes, then turn out onto wire rack and cool at least one hour before serving. I made this bread the day before the big meal, too. Flavorful, moist and delicious. Definitely will become an annual tradition! 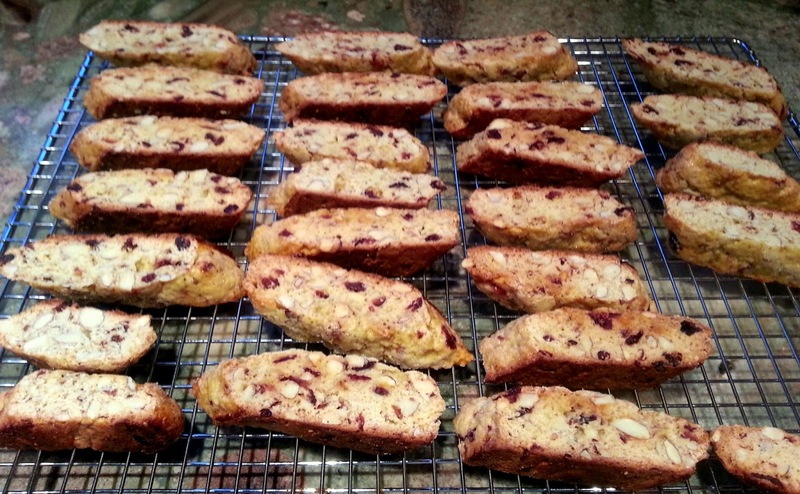 Biscotti is not difficult to make, but does require several steps to prepare. Heat oven to 350 degrees. Lightly oil a large rimmed baking sheet. Put the flour, 3/4 cup of the sugar, lemon zest, baking powder and salt in a stand mixer fitted with the paddle attachment. Mix on low speed until combined, about 30 seconds. Add the almonds and cranberries and mix to combine and break the nuts into pieces about 1/3 to 1/4 their original size--1 to 2 minutes. Turn the dough out onto a clean work surface and pat it into a 5 inch disk. Halve the disc. The dough will be sticky. Lightly moisten your hands with oil or water, then squeeze and pat one piece of dough into a log. 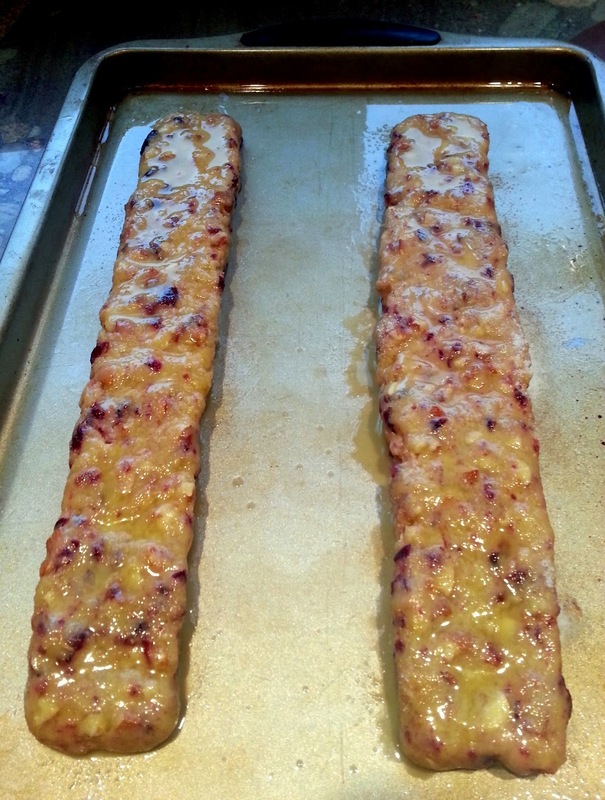 Lay the log lengthwise on one side of the prepared baking sheet. Stretch and pat the dough into a flat loaf that's about 12 inches long and 2-2 1/2 inches wide. Repeat with the remaining dough. Leave at least 2 inches of space between the loaves. Mix the reserved beaten egg with 2 tsp. water. Lightly brush the loaves with the egg wash and sprinkle with the remaining 1 Tbsp. sugar. You will not use all of the egg. Bake until pale golden around the edges and just set, 20 to 25 minutes. There may be cracks on the surface. This is not a problem. Reduce the oven temp to 300 degrees. Set the baking sheet on a cooling rack. Gently slide an offset spatula under each loaf to loosen it. The egg wash may make the loaves stick a bit. Let cool on the sheet for 5 minutes, then transfer to the rack and let cool for 15 to 20 minutes longer. They will cut easier when they are still a little warm. Transfer the loaves to a cutting board. Using a sharp knife, cut the loaves on the diagonal into 1/2 inch thick slices. Arrange the slices, cut side up, on the baking sheet. Bake for 10 minutes, then flip and bake until golden, about 10 more minutes. Transfer the biscotti to the rack and cool completely. They will become firm and crunchy as they cool. The biscotti can be stored in an airtight container at room temp for up to 2 weeks. Mine made it until the weekend after Thanksgiving! If they lose some of their crispness you can reheat in a low oven (200 degrees) for a few minutes and they become crunchy again. 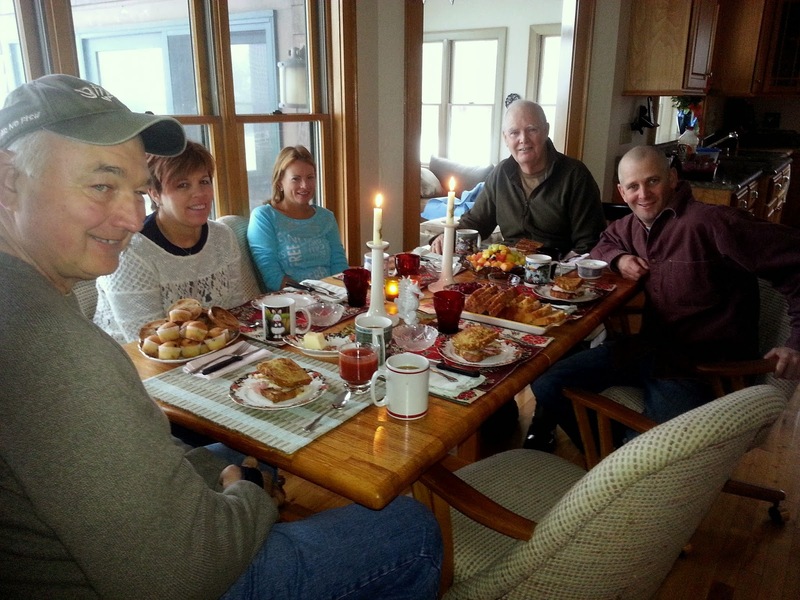 We had a crowd spending the night and the next morning I made a modified Monte Cristo for breakfast. Beat 1 egg per person in a large bowl with a little salt. Dredge sliced bread through the egg--I used a nice multi grain with seeds--and fry in butter as you would French Toast. Layer slices of turkey, ham, and lots of Swiss (or other) cheese onto the eggy bread. Top with another piece of egged fried bread. Cover the frying pan and reheat to melt the cheese. Serve. Because I also made a ham for Thanksgiving, throwing together this breakfast sandwich was very easy. Thank you for sharing another meal with me. If you'd like to see my whole Thanksgiving menu, shoot me an email. who continue to follow my blog. And remember...SANTA CLAUS IS COMING TO TOWN! 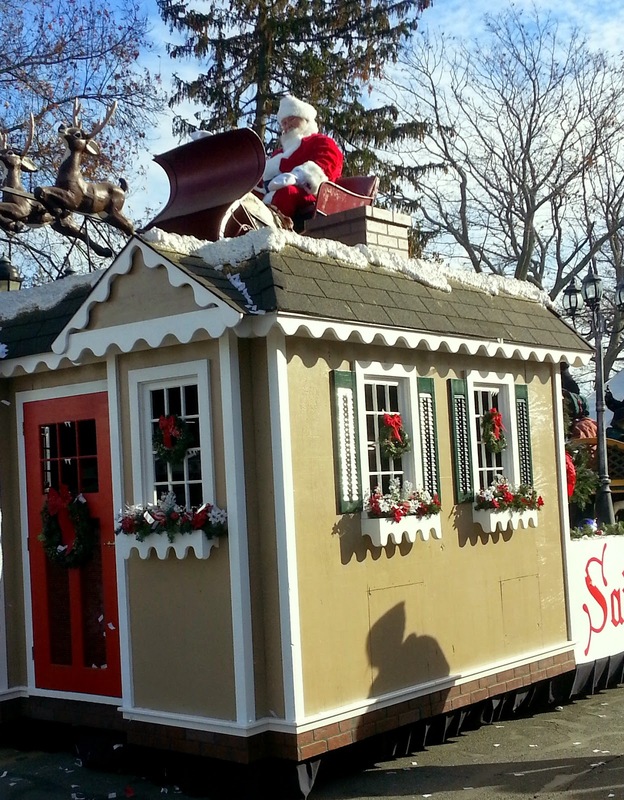 Here's Santa at the annual Thanksgiving Day Parade in Plymouth! ...SO YOU BEST BE GOOD! I love birthdays and I love cooking special occasion food and most of all I love to please people with food so this year's birthday celebration for my husband was an eating extravaganza! Ready to go into the fridge for the night. You know I like "do-ahead" food. This breakfast treat is put together the night before and then baked next morning. It was rich and delicious and would make a fantastic holiday breakfast. I cut the recipe in half and it was still huge. I am going to give you the full recipe. The recipe calls for baking in a 9x13 pan which would have been much better than the deep dish I used. It cooked without a problem, but did not look that attractive when served. If you use the 9x13 pan you can cut into squares. I dusted the top with cinnamon before refrigerating overnight. 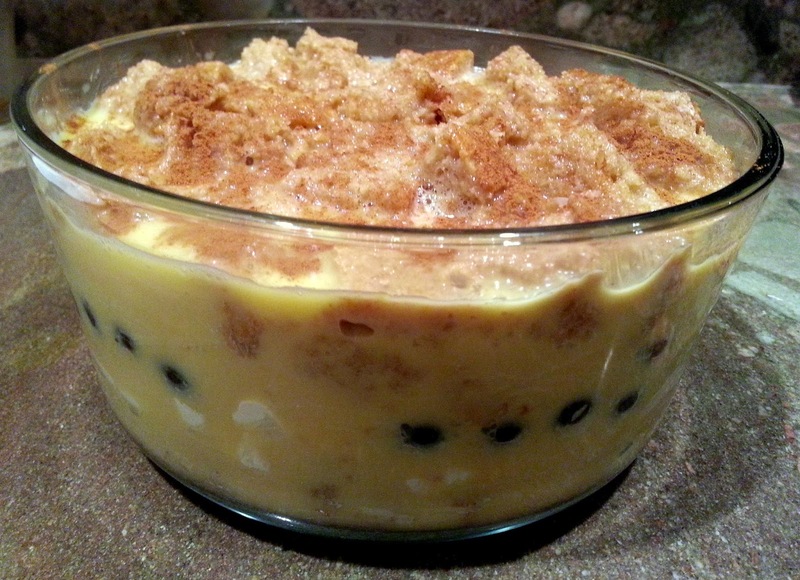 The recipe did not call for it, but I think cinnamon and blueberries are a natural pairing. Even though the French Toast does not look that great, my husband does! Lightly grease a 9x13" baking dish. Arrange half the bread cubes in the dish, and top with cream cheese cubes. Sprinkle 1 cup blueberries over the cream cheese and top with remaining bread cubes. In a large bowl, mix the eggs, milk, vanilla, and syrup. Pour over the bread cubes. Cover and refrigerate overnight. Remove the bread cube mixture form the fridge for about 30 minutes before baking. Preheat oven to 350 degrees. Cover and bake 30 minutes. Uncover and continue baking 25-30 minutes until center is firm and surface is slightly browned. You can test done-ness the way you would a custard by inserting a knife in the center. If it comes out clean, it is done. 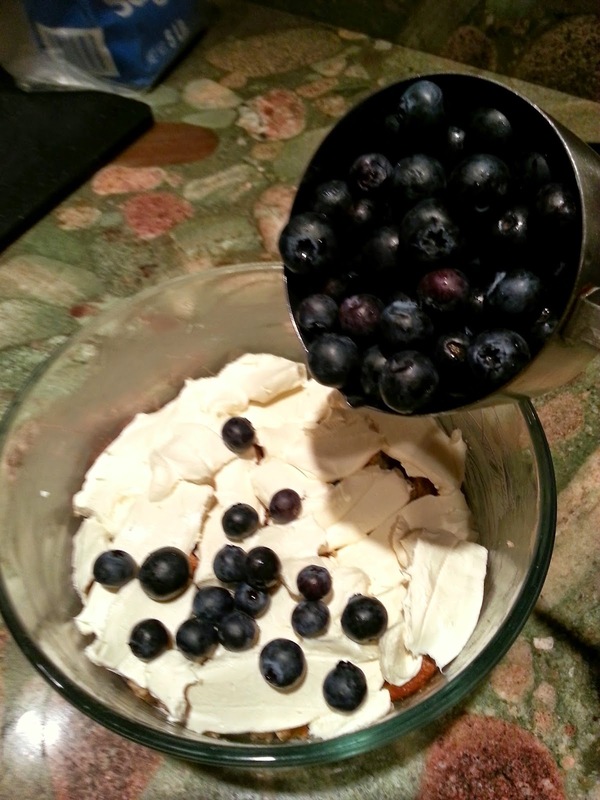 To make the blueberry syrup: In a medium saucepan mix the sugar, cornstarch and water. Bring to a boil. Stirring constantly cook 3-4 minutes until the blueberries burst. Stir in the butter and pour over the baked French Toast. 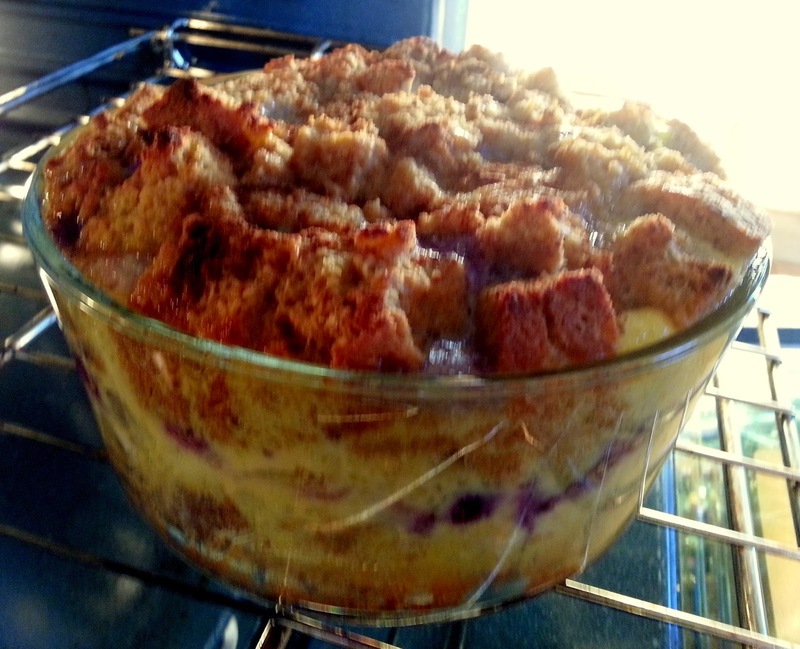 This is more like a bread pudding than a stuffed French Toast, but really very yummy! I served with crispy bacon. Lobster broth (from the cooked lobsters) to thin the sauce as needed. * I cooked and shelled the lobsters the night before which made assembly a little smoother, but this still is a dish with lots of steps. For the lobster sauce: In a large saute pan, add the butter and melt. Add garlic and shallots and saute until golden brown. Add tomato paste, cream, seasoning and simmer gently for about 30 minutes. Add lobster and basil and saute 5 minutes. Add sherry and reduce for 2 minutes. The long, slow cooking will thicken the sauce and deepen the flavors. Thin it with the lobster broth if it gets too thick. Remove from heat and cool. Blend the sauce to make very smooth. Finely chop the rest of the cooked lobster. In a large bowl, combine lobster and ricotta and mix well. Splash in a little sherry, salt and pepper. 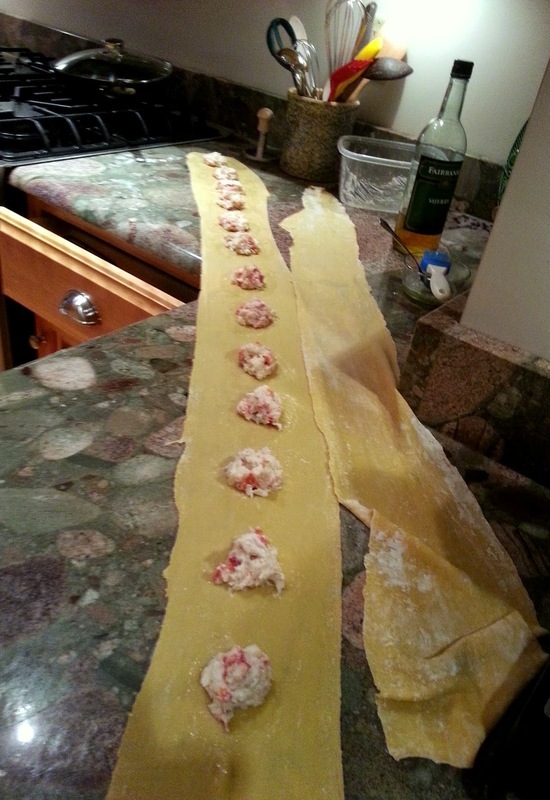 Lay out the first piece of pasta dough and place a heaping tablespoon of stuffing 2 inches apart. My complaint about Lobster Ravioli in a restaurant...they never use enough lobster. Using a pastry brush, brush egg white around each bit of stuffing making the dough moist, but not wet. Take the second piece of pasta and cover the bottom piece with the stuffing. Press around each ravioli being careful not to squeeze the stuffing out. 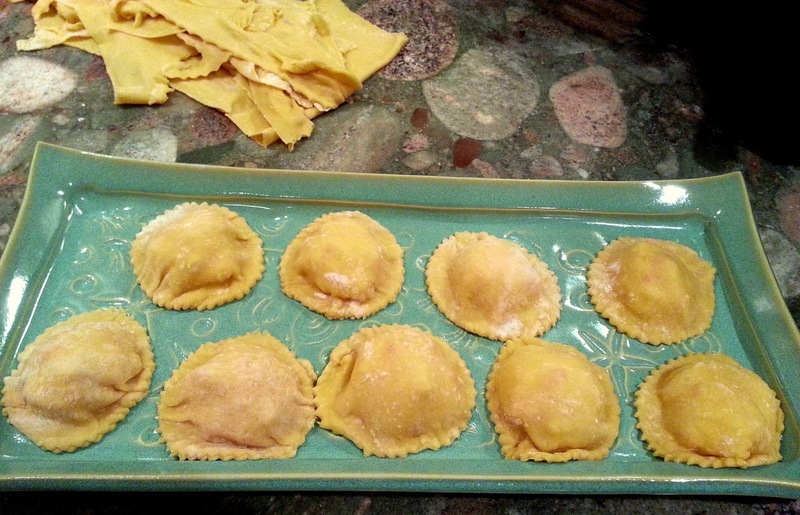 Using a round ravioli cutter, cut each ravioli round and put on a sheet pan sprinkled with semolina (semolina is flour made from Durum Wheat; excellent for making pasta-I like Bob's Red Mill)...or use fine corn meal or flour. As you can see in top of photo, you will have left-over pasta. 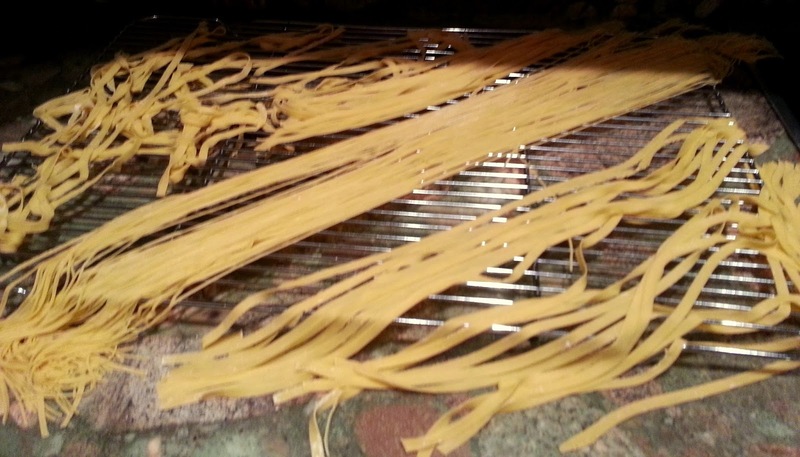 I re-rolled and made both fettuccini and spaghetti. Notice I forgot to dust my tray with semolina...bad mistake. The raviolis stuck, but I was able to lift them up to cook without breaking. Nervous moment...! Place ravioli in gently (gentle is key as these are delicate pastas) boiling water and cook for 8-10 minutes or until al dente. Reheat the lobster cream sauce and put a generous portion on each plate. 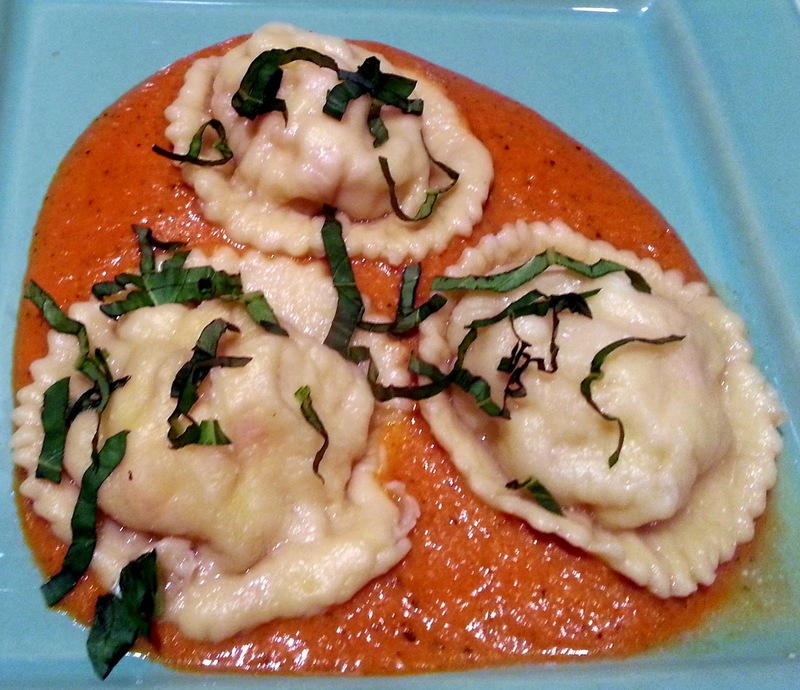 Top the sauce with raviolis and basil. Enjoy! 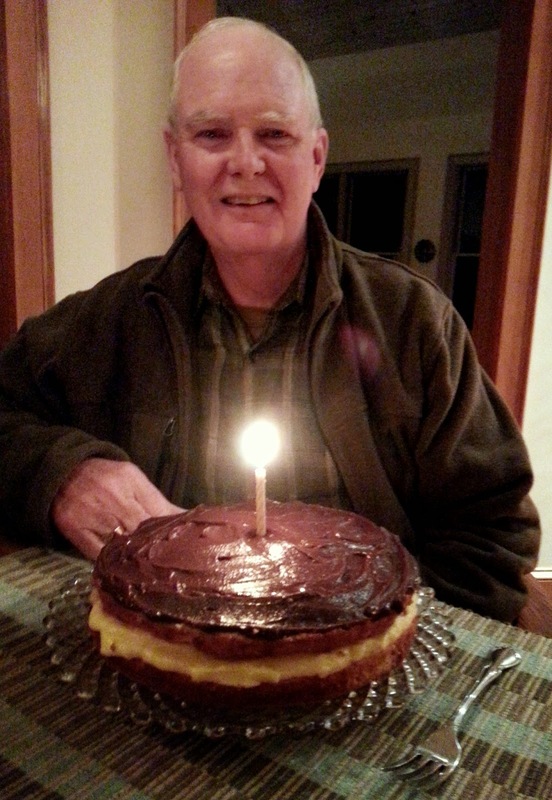 This year Jerry requested a Boston Cream Pie which was one of his favorite desserts as a child. It really is more cake than pie, but I must say this was one of the best Boston Cream Pie's either of us has ever had. HOW DID THE BOSTON CREAM PIE GET ITS NAME? The pie originated in the same spot as its sibling, the Parker House Roll. Well, that's sort of true — the Boston Cream Pie as we know it today originated at the Parker House Hotel in Boston. 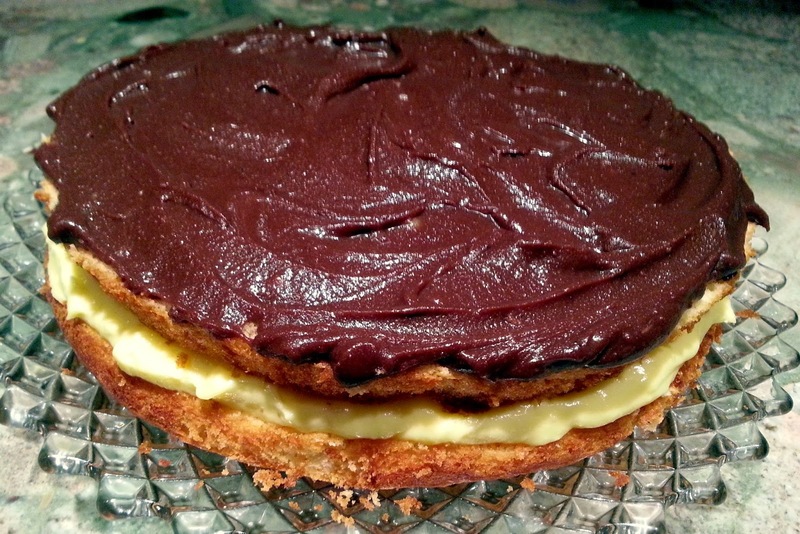 The Boston Cream Pie was originally a pie consisting of white cake with a custard filling or topping. That cake/pie had its origins in the early days of colonial history, and was sometimes called a Pudding-Cake Pie, although there have been references to a similar English custard cake, so its true origins probably hark back to Britain. If, in the early days, it included a raspberry jelly filling, it was called Mrs. Washington's Pie. In any case, this recipe is a WINNER! And, as some of you may know, the Boston Cream Pie is the OFFICIAL DESSERT OF MASSACHUSETTS! * I don't always, but this time did use cake flour and think it made a difference. ** My neighbor, Karen makes the best chocolate ganache I have ever tasted. She and her husband were over for dinner recently and brought her famous ganache. I froze the leftovers so thawed for this occasion. Preheat oven to 350 degrees. In a medium mixing bowl combine flour, sugar, baking powder, and salt. Make a well in the center of the flour mixture. Add milk, oil, egg yolks and vanilla. Beat with an electric mixer on low to medium speed until combined. Beat an additional 3 minutes on high speed and set aside. In a large mixing bowl, beat egg whites and cream of tartar on medium to high speed until soft peaks form. Hint: Egg whites at room temperature whip faster than cold eggs. Pour the egg yolk/flour mixture over the egg white mixture and gently, but thoroughly fold together. Pour batter into a 9 inch greased pie pan. Bake for 25 to 30 minutes or until the top springs back when lightly touched. Invert the pan onto a wire rack. Cool completely. I made the cake the night before, kept covered on the counter. Pastry Cream: In a medium saucepan, heat the milk and vanilla to a boil over medium heat. Immediately turn off the heat and set aside. Pull off the skin that has formed. In a bowl, whisk the 6 egg yolks and granulated sugar until light and fluffy. Add the cornstarch and whisk vigorously until no lumps remain. Whisk in 1/4 cup of the hot milk until incorporated. This step is important so your eggs don't get cooked when hit with the hot milk. Whisk the remaining hot milk mixture, reserving the empty saucepan. Pour the mixture through a strainer back into the saucepan. Cook over medium-high heat, whisking constantly until thickened and slowly boiling. This is a great upper-body work-out! Remove from the heat and stir in the butter. Let cool slightly. Press a piece of plastic wrap directly on top of the Pastry Cream to prevent a skin from forming. Chill at least 2 hours, but this can also be made the night before. I made it first thing in the morning, but waited to assemble the cake until just before serving. Ganache: In a medium bowl, pour the boiling cream over the chopped chocolate and stir until melted. OR in the Search Recipe Box (top left) type in Karen's Chocolate Ganache for a super, rich recipe. To assemble the Boston Cream Pie: remove the cake from the pan. Cut the cake in half horizontally. Place the bottom layer on a serving plate and spread with the Pastry Cream. Top with second cake layer. Spread chocolate ganache over the top. It's OK if the chocolate drips down over the sides. Keep in refrigerator until ready to serve. I have lots more food I want to talk about, but Thanksgiving is less than a week away so next time we will talk about some of the new treats I am going to include in our Thanksgiving feast, such as Oysters done 3 ways, Cranberry-Almond Biscotti's, and a Mile-High Apple Pie. RELAX AND ENJOY YOURSELF IN THE KITCHEN! HELPING HANDS: MONKEY HELPERS FESTIVALE IS HERE! It is truly my honor and privilege to work with this fantastic organization. 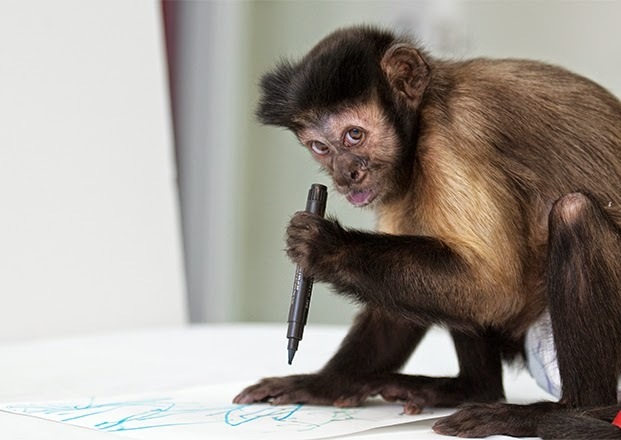 Helping Hands: Monkey Helpers for the Disabled raises, trains, and carefully places capuchin monkeys to be service animals or "helpers" for adults living with physical disabilities. We're going to talk about some of my food and beverage recipes in a moment, but first, let me tell you about this great annual fund raising event--Festivale--coming on October 25th. And speaking of food!...they have organized 15 of Boston's finest restaurants (Mistral, Rialto, Ostra, Basho to name a few!) to offer tastings all night. PLUS Ketel One is providing an open martini bar (that could get interesting!) and there will be other specialty cocktails, wine and beer throughout the evening. Live music and a very robust silent auction complete the night. Sounds like great fun to me. For the first time at this event, Monkey Helpers are going LIVE with their silent auction. Even if you cannot attend the event, beginning October 6 you can bid online for the prize(s) you want--just go to the web address above for details. Prizes include things like Walt Disney World Theme Park passes; luxurious hotel stays throughout the country, such as 3 nights at The Atlantis Casino Resort & Spa in Reno, NV; very fancy His/Her Swiss made watches, and other jewelry; and one-of-a-kind items like an autographed photo and feather from 'Big Bird' donated by Big Bird himself!--I am not kidding. Really looking forward to this event myself. It's being held this year at WGBH Studios which makes for an interesting venue. Hope to see you there, but if you can't make it in person, check out the website to see how to bid online for auction prizes. You will be competing with bidders all over the world! Thank you for allowing me to share this wonderful organization with you which has become such an important part of my life! mixing a very special Mint Mojito! Put sugar, mint leaves (you don't need to measure precisely-the more mint the better), and the squeezed juice and lime halves into a shaker. Muddle well with a muddler or back of a spoon to dissolve the sugar and to release the mint flavor. Add the rum. Stir very well. Fill a glass with ice cubes. Strain the contents of the shaker into a glass. 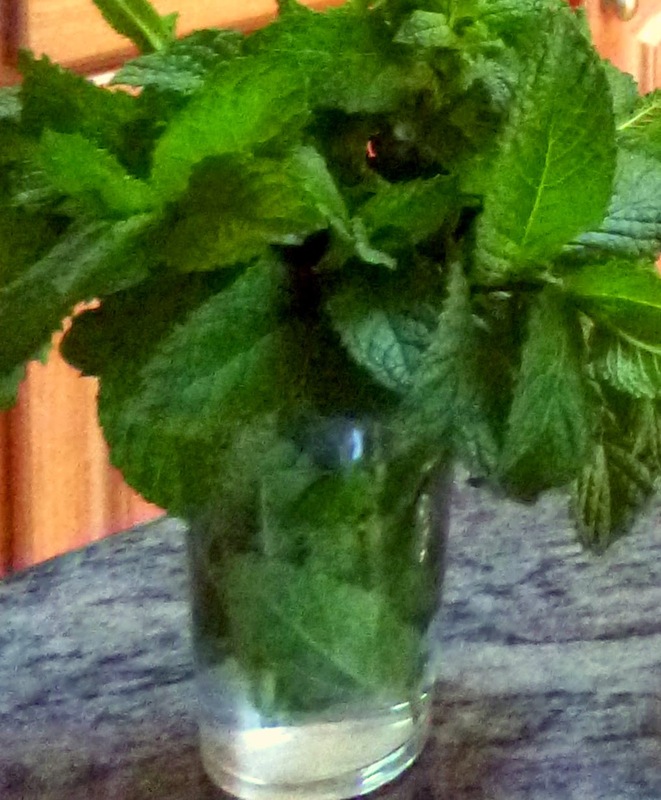 Top with soda water and add a sprig of mint. Taste and adjust for more lime or soda water. Diana is the official "taster" to make sure her husband is mixing correctly! This delicious drink was created in 1971 by the owners of the Soggy Dollar Bar located in White Bay on the island of Jost Van Dyke in the British Virgin Islands. This is right next door to Virgin Gorda where my husband and I spent 2 glorious weeks (remember the Chicken Foot Soup?!) last November. They make Pain Killers on Virgin Gorda, too! Blend the juices and Coco Lopez and pour over ice in a tall glass. Add rum and a spinkle of grated nutmeg. Garnish with orange slices, pineapple and or a maraschino cherry. MY HUSBAND'S FAVORITE PART OF ANY MEAL! This luscious cake is rich, moist and filled with flavor! I made it the night before our dinner so the fruit had a chance to blend together beautifully. 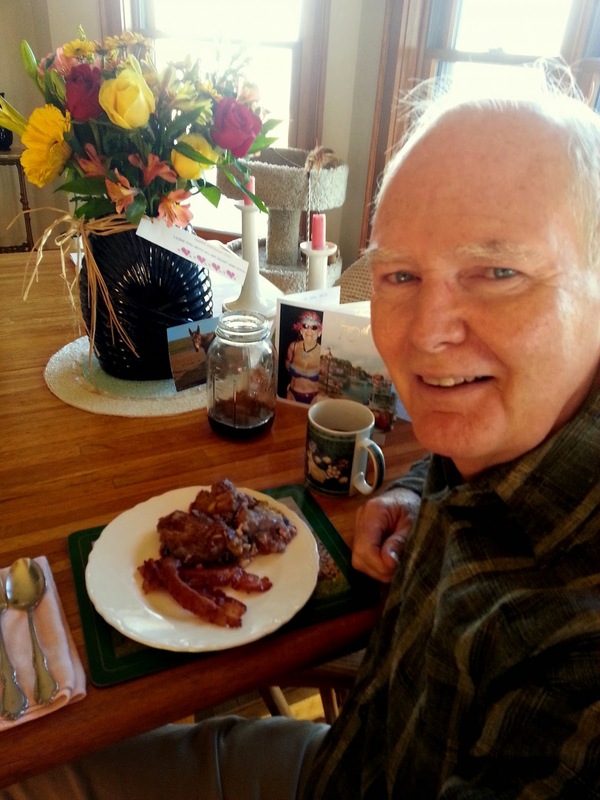 My Dad used to love making pineapple-upside down cake. It was his signature dessert and he always made it for me when I came home to visit or for special occasions. 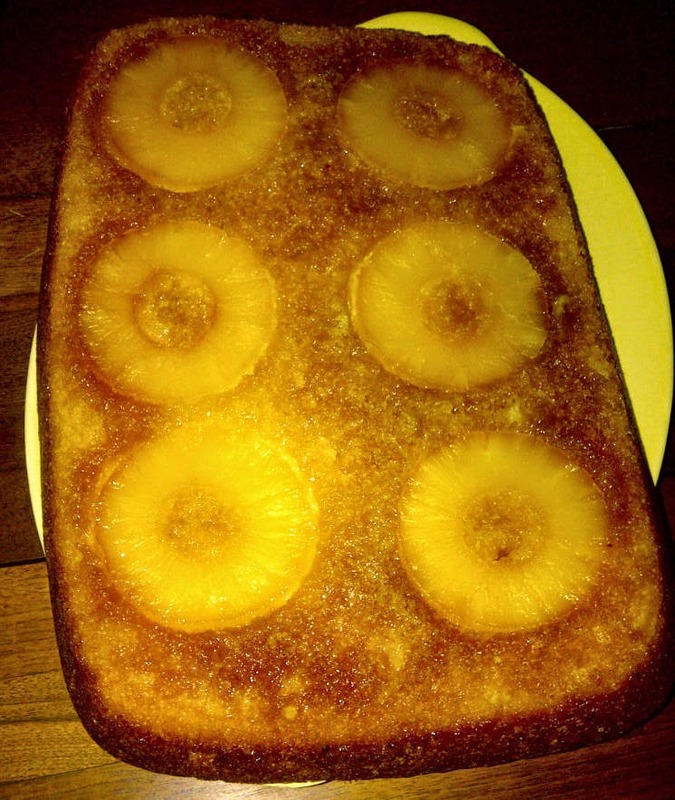 Dad made his Pineapple Upside-Down Cake in a square pan. Upside-down cakes are classically made in a cast-iron skillet because it conducts heat so well and gives the cake a crisp edge, cooks evenly and keeps it moist. I did not use my cast iron skillet as I make so many savory meals in it I thought my cake would come out tasting like garlic. Instead, I used a heavy, large glass cake pan and it worked very well. No danger of this cake being dry! Preheat oven to 375 degrees. 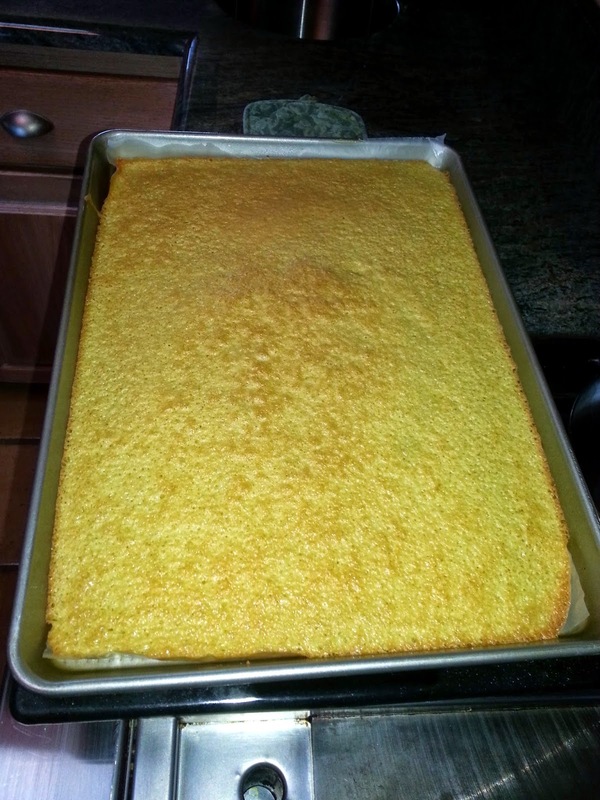 Melt butter in a heavy cast iron skillet is you are using or melt and add to your cake pan. Sprinkle with brown sugar. Drain pineapple slices over a bowl, reserving 1/2 cup juice. Place 1 pineapple ring in center of skillet or pan. Cut remaining pineapple rings in half; arrange around center pineapple ring. Sprinkle evenly with coconut. Set aside. Lightly spoon flour into a dry measuring cup; level with a knife. Combine flour and next 5 ingredients (through salt) in a large bowl. Combine reserved juice, banana, oil, and egg, stirring with a whisk. Add pineapple juice mixture to flour mixture stirring until combined. Pour flour mixture over coconut. Bake at 375 for 30 minutes or until wooden pick inserted comes out clean. Invert onto a wire rack. Serve warm or at room temp. I made it the night before and left on counter overnight. This cake is so easy and a real WOW! I guess you know by now that I LOVE to cook. It makes me very happy to share my passion with you. 'Cook With Cindy' just reached over 10,000 views! 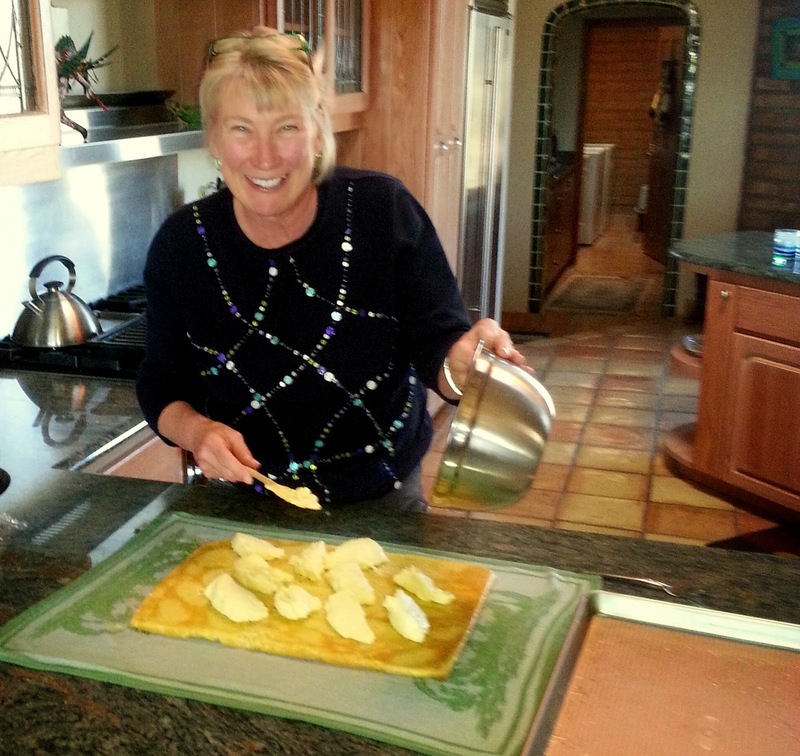 Thank you for taking a look and please keep having fun in your own kitchens throughout the world! UNTIL NEXT TIME MUCH LOVE FROM MY KITCHEN TO YOURS! PORK STUFFED PORK--LIKE NONE OTHER! This took a little fussing to put together, but was well worth it. One of the best pork roasts I have ever made or had! And the 'fussing' for me really is the fun part! This was the centerpiece of my Easter dinner. 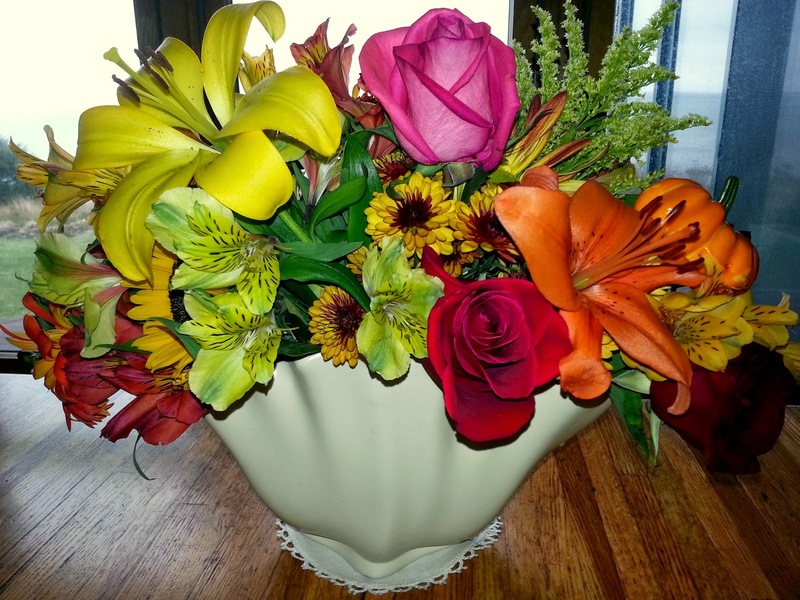 It is very special and would make you proud to serve for any holiday or special occasion. I like themed dinner parties and for this one we did Caribbean. I served this stuffed pork roast with a slightly spicy Mango Papaya Salsa, but first let's talk about pork. Blanch kale in boiling salted water until just wilted-about 1 minute. Remove with tongs, dry, and transfer to tray or baking sheet and place in refrigerator to cool. Remove any large or tough ribs. Melt 3 Tbsp. butter in a large skillet over medium heat. Add the sliced apples and cook until edges are just browned. Remove and set aside. Using the same skillet melt 2 Tbsp. butter in a large skillet over medium heat. Cook onion stirring often until golden-about 8 minutes. Add chopped apple, garlic, dried thyme and rosemary. Stir together to coat all with butter and cook for a couple minutes. Add brandy and cook until liquid is absorbed-about another minute. Stir in salt/pepper. Transfer mixture to a bowl and cool completely. After it is cooled, add ground pork and stir well to combine. Start by butterflying your pork loin. Using a sharp knife cut the loin in half without cutting all the way through. Pull the meat back as you cut and keep cutting until the entire roast is flat. Wrap the loin in plastic wrap. Using a meat mallet or rolling pin, pound to an even thickness. Liberally salt/pepper inside and out of the loin. Next, place kale leaves on top of the loin in one even layer overlapping each leaf a little. Add the slightly sauted apple slices and then spread the filling on top. Drizzle the olive oil in bottom of roasting pan. I put additional apples in bottom of baking pan to add a little more moisture. Roll it all together into a tight cylinder and wrap proscuitto around the roast. Lay the rosemary sprigs on top and tie it all together. Place your stuffed, rolled, and tied roast in the pan. At this point you can set aside in the fridge. Let stand at room temperature for 1 hour before continuing. Preheat oven to 400 degrees. In a skillet large enough to hold your roast melt 1 Tbsp. butter. Get skillet very hot and carefully brown pork on all sides-about 5 minutes. Place the roast back into the roasting pan. Add 1/2 cup hard cider and the chicken stock to the skillet. Stir to combine any brown bits from the pork and reduce for 5 minutes. Add this to the roasting pan. Roast the pork for about 1 1/2 hours (instant read thermometer registers 140 degrees for medium pork). Remove from the oven, tent with foil and let roast rest for at least 20 minutes before cutting. Cut 1" thick slices and serve with Mango Papaya Salsa. To make the salsa peel and chop 1 large and very ripe papaya and 3 mangos. Add 1/2 red onion finely diced and a little heat--use either dried hot pepper or add a diced fresh jalapeno. I used the fresh pepper. Add salt to taste. Let sit for at least an hour so flavors meld. Can be made the day before serving. Next time I'm going to share the dessert I made for our Easter celebration. 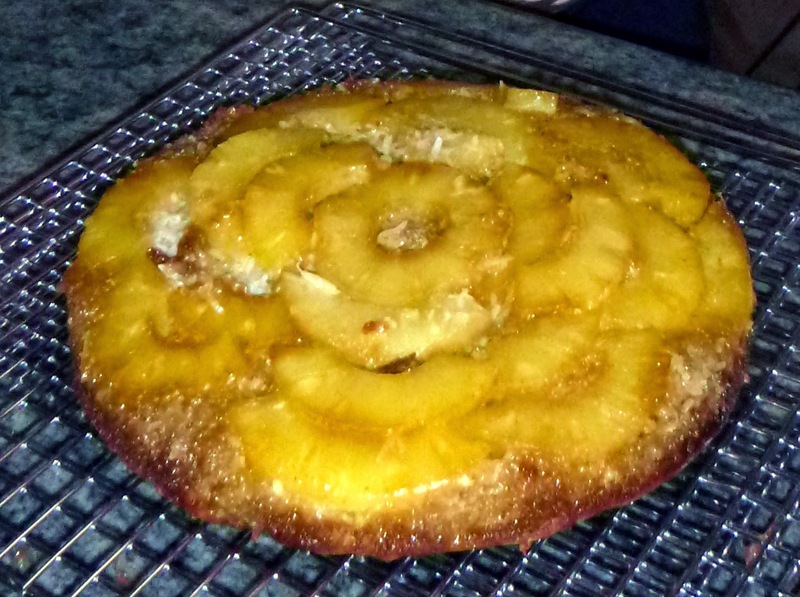 Pineapple, coconut, banana upside down cake! I made this the night before so it was perfectly gooey and wonderful next day. We started this feast with a couple traditional Caribbean cocktails and yummy hors d'oeuvres so we will get into those as well. Until then, please keep having fun in the kitchen. My husband, Jerry and I, all decked out in our Easter bonnets.